Hot Sauce Art… Only in L.A. If you haven’t already paid a visit to the Chinese American Museum in Los Angeles, then you might want to make it a point to do so before July 12th. That’s when the “hot” (literally) exhibit, “L.A. Heat: Taste Changing Condiments,” leaves the museum. The showcase highlights two of America’s popular hot sauces –Sriracha and Tapatio– in various iterations of art. Part kitsch, part amazing, the art pieces singles out the two condiments, which have since become staples in the modern American kitchen. Both sauces are “homegrown” in the Los Angeles region; an unofficial ode to two of the area’s most influential minority groups: Asian Americans and Central Americans. Sriracha, as you know, is an extremely popular condiment in Asian restaurants across the country. And Tapatio is a “Mexican” take on traditional hot sauce. While both are mistakenly ethnic, they are genuinely American-made, but traditionally inspired. What’s more compelling is how the sauces have made an impression on pop culture, and this is evident in the works presented. From cookbooks to prints to paintings, the representations clearly indicate that these and other hot sauce brands have become a true part of American culture–food especially. You can read more about the exhibit in the NPR blog, “the salt.” And information on the Chinese American Museum can be found here. 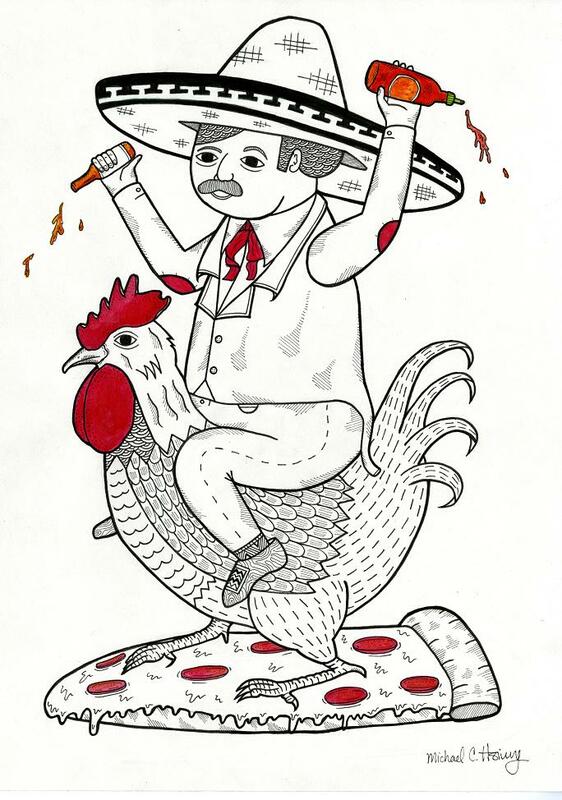 Image of Michael C. Hsiung’s On The Topic of How Various Sauces Can Make Pizza Better is a drawing of the Tapatio logo’s sombrero-wearing man riding the Sriracha logo’s rooster. Courtesy of the Chinese American Museum.